We’ve highlighted many illustrators during our 28 Days Later campaign, and Shadra Strickland‘s interview has always been a personal favorite. Since our interview in 2009, Ms. Strickland went on to illustrate many more books, including White Water (Candlewick Press, 2011); Please, Louise (Simon & Schuster, 2014); and Sunday Shopping (Lee & Low Books, 2014). A forthcoming book, Loving Vs. Virginia, written by Patricia Hruby Powell, has already garnered a starred review from Kirkus and is currently featured in the Society of Illustrators Original Art Show. The title of her blog says it all: LIVING THE DREAM. A dream born many years ago, when she was just a child. A dream nourished by a supportive mother. A dream guided through instruction at Syracuse University. Polished at the School of Visual Arts. But Shadra Strickland’s dream didn’t end there. Soon after graduation, she was offered an opportunity to illustrate her first book, an emergent reader called BIG OR LITTLE, written by Fonda Bell Miller. It was published by Lee & Low Books in 2002. 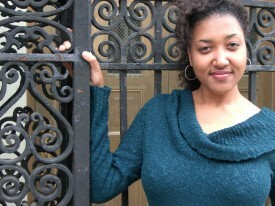 Her second book, BIRD, written by Zetta Elliott, published with Lee & Low Books in 2008. Following the success of BIRD, the dream began to collect awards. 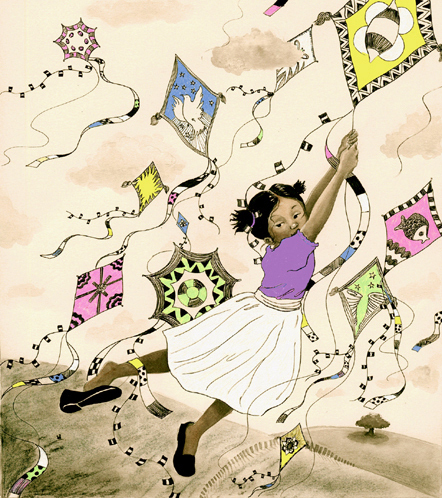 In 2009, Shadra became the recipient of the American Library Association’s John Steptoe Award for New Talent, given by the Coretta Scott King Task Force, and the Ezra Jack Keats New Illustrator Award. 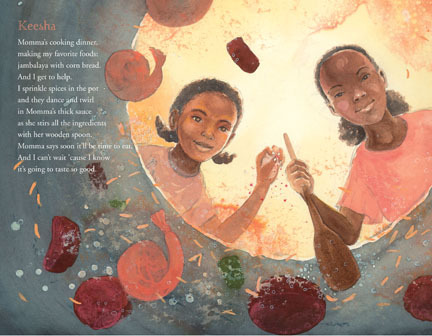 Shadra was a contributor to the book Our Children Can Soar: A Celebration of Rosa, Barack, and the Pioneers of Change, published by BloomsbuyUSA in 2009, which has also received major accolades, including an NAACP Image Award nomination for Outstanding Literary Work for Children. With Our Children Can Soar, she paid tribute to Ruby Bridges, who became the first African American child to attend an all-white school in the South. 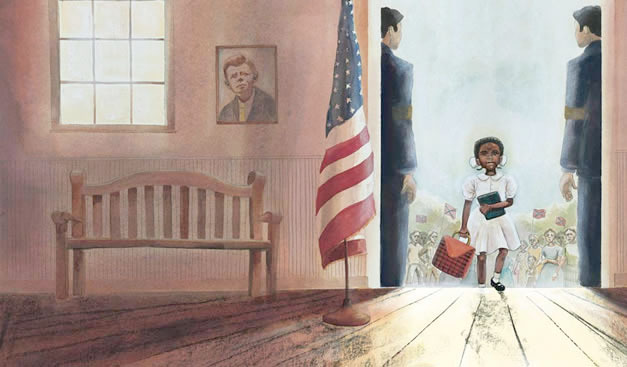 Her illustrations are full of emotion and successfully capture the quiet strength of Ruby Bridges, using soft colors and delicate line work. Please talk about your most recent book. 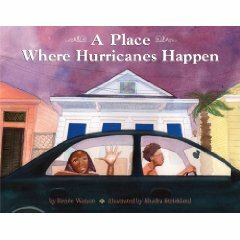 My next book is called A PLACE WHERE HURRICANES HAPPEN. It’s the story of Hurricane Katrina told through the voices of four neighborhood friends. “Hurricanes” was challenging for me for a couple of reasons. First, it featured four main characters, and second it was the story of Hurricane Katrina. I had never been to New Orleans before working on the book. I tried to be very careful not to make the images journalistic. What is the primary medium used in your work? Right now I primarily use watercolor and gouache. I studied illustration at Syracuse University where I experimented with a few different mediums, mainly oil and acrylic, but I didn’t learn how to “play” until years later in graduate school at SVA. Why did you choose to illustrate for children? Storytelling comes naturally to me. When I was young my family (grandma, cousins, aunts, uncles, etc.) would sit around my grandmother’s kitchen table and tell stories for hours on end. Making picture books just made the most sense—I get to read great stories and create world for the characters in which to exist. I also need my work to function in some way. The idea of people learning from my work and living with the images for years and years amazes and excited me. Are there any particular illustrators or fine artist who have inspired you, past or present? I am a fan of many many artists. If I could visit anyone’s studio, I think I’d like to watch William Kentridge work on a film, Jerry Pinkney draw, Tom Feelings do anything, Pat Cummings paint, Jon Muth compose, and Walton Ford paint. With BIRD, you’ve collected many accolades, including the Coretta Scott King / Johnsteptoe New Talent Award, and the Ezra Jack Keats (New illustrator award). What was the biggest change, unexpected result, or interesting observation you’ve noted since receiving the awards? For me winning the John Steptoe and Ezra Jack Keats Awards for BIRD was surreal. The most interesting and unexpected result was the amount of work that came flooding in. I also underestimated the amount of celebratory cupcakes I could consume. As an illustrator who happens to be African American, do you ever feel any special pressures, or unique challenges? I try to pick projects that I connect to emotionally and that align with the way I see the world or wish the world could be. For BIRD I loved how Zetta portrayed her male characters. They were supportive and loving to each other so I just added to that in the imagery. I also try to be careful not to villanize people, even if they are making bad choices for themselves and the people around them. I love painting different shades of African-American people. My family is made up of many different shades of black and I feel that’s important and true to life in painting pictures. So, I guess, no, I don’t really feel any “special” pressure. I just try and make the work as sincere as I can and as strong as I can. The rest will fall in place. Please talk about your process of illustrating a book. I start with an 8.5 x 11 “Cheap Pad”. As I read, I fill up the sketchbook with many many possibilities for the story. As I thumbnail, I scan each image, blow them up, and drop them into a mechanical. Once I am happy with the look of the rough dummy, I make a pdf and e-mail it to my editor and art director with any notes I may have embedded in the file. This is the most I do with a computer in making the books. Once the dummy is okayed, I print out the sketches to size and refine the drawing. Unfortunately, my finishing process is never cut and dry. Each story is different and requires something different from me. For example, BIRD’s world was ballpoint pen and charcoal against some airier skies. HURRICANES paired the brightness and energy of New Orleans against an impending storm. In OUR CHILDREN CAN SOAR I needed to go back in time and make things look aged and bare. I try and go straight to finish if I have a strong vision for a piece. Because I experiment a lot; sometimes…most times I have to do a piece many times before it’s right. For Bird’s rooftop scene I had to paint it eight times before I got what I wanted out of it. If you could wave a magic wand and completely change professions, what would you be doing today? My road, like my work process, was long and crooked. I stumbled many times, but I never gave up. I finished my first emergent reader book with Lee and Low right after college. I was teaching with Atlanta Public Schools then. After the first project I worked on some smaller e-books and some projects with local authors. After three years of teaching art I applied to SVA. While in grad school I befriended three other illustrators and we showed our work to as many art directors and editors who would see us. During that time I also worked at an after school program in Chinatown and interned as a design assistant with Penguin for a semester. After graduation all of my friends landed book deals, but I still kept getting close but no cookie. My graduate advisor, Pat Cummings, recommended me to Chris Myers and I became his assistant for a year. She also introduced me to an old student of hers who was leaving Bloomsbury and that connection turned into a four year freelance design position at the company. That first year after grad school I illustrated a book with a Korean publishing house, Tantani Media. I kept making work and sending it out to people who liked my work via e-mails and postcards and one night at the Society of Illustrators’ Original Art Show I ran into my very first editor at Lee and Low, Jen Frantz. She asked me in for a meeting and the rest is….history. I can honestly say that every experience I’ve had has contributed to the work I do now. I wouldn’t change a thing (except win the lottery). What do you find most challenging about the book creation process? The biggest challenge for me is balancing truth and fantasy. For a book like HURRICANES, I needed to stay true to the look and feel of New Orleans, but I also had to make art out of it. Learning how and when to take artistic license is a challenge. I had a bunch of educational books and books with play along records that I’d read and listen to over and over again. My favorite “high art” picture book was THE SNOWY DAY. I can still remember the smell of the paper. I’m still learning how to balance everything. I recently moved back home to Atlanta for a few months after leaving my job at Bloomsbury and that has given me great peace of mind with more time to work. I go through cycles of getting everything done and not sleeping and getting very little done and not sleeping. Eventually I will clone myself so one of me can get some shut eye. Do you visit schools? Is there any particular message you like to leave with children when you speak? I love visiting schools. I try to give kids as much positive energy as I can about life. My main message for kids is that it’s okay to make mistakes. If you believe in yourself and what you want to do in life you can do it in spite of the small missteps along the way. This may sound like a cop out, but my dreams are already coming true. I am a part of some truly phenomenal projects (that I hope I can live up to). My wish for the future is that I continue bringing outstanding stories to life alongside some of my own. My mom is my biggest cheerleader. She works in education so she gets to have bragging rights in her school. In addition to her are my friends, librarians, kids, and people who love art and books! What’s on the horizon, what can your fans expect? Ha! Fans. There are so many books in the works, which is amazing, but wow, I need to start taking my vitamins! My next book is with Candlewick, called WHITE WATER. It’s a story of segregation in 1950s Alabama. Here’s the thing: I have an ARC of Shadra’s newest book, A PLACE WHERE HURRICANES HAPPEN. I’d planned to keep it all to myself, but then realized it wouldn’t do Shadra much good buried here in my studio. So, I’d like to give it away. If you’re a librarian or teacher who’d like a sneak peek of Shadra’s newest work, and wouldn’t mind posting some nice comments (Twitter, Facebook, blog) after you receive it, then post a comment in today’s highlight. I’ll close my eyes and draw a name, then send you the copy. After reading this article and seeing her beautiful illustrations I know I must have Shadra Strickland on my shelves. Thank you for highlighting this artist!